Note to HALO Monthly recipients: Whether or not you are able to make a donation to HALO, you will continue to receive the newsletter. However, there are expenses involved in producing a quality newsletter. Therefore, we suggest an annual donation of $25.00 for HALO membership, which includes our newsletter. Of course, donations in any amount to support the work of HALO will be gratefully accepted. All donations are tax-deductible. Please send checks only to: HALO, P.O. Box 324, Chisago City, MN 55013. On Friday and Saturday, January 25 and 26, my husband Denny and I were in Albuquerque, New Mexico at the “Stopping Assisted Suicide in Your State” international conference, hosted by Alex Schadenburg (a HALO board member) and his organization, the Euthanasia Prevention Coalition (EPC). Attendees—in person and online—were treated to talks about preventing the legalization of assisted suicide and euthanasia. The expert presenters—activists, writers, investigators, legislators, etc.—hailed from the United States, Canada, Sweden, the United Kingdom, and Australia. Friday’s sessions addressed bills that are coming up in individual states. Already this year, bills have been introduced to legalize assisted suicide in Delaware and New Mexico, and to expand the existing law in Oregon. * The proponents of assisted suicide are changing their game plan. New Mexico’s bill attacks physicians’ conscience rights and the Delaware bill attempts a change in the language to normalize assisted suicide by redefining it as palliative care. Oregon’s expansion bill eliminates both the 15-day waiting period when the prescribing doctor wants an exception made, and the requirement that the patient have a prognosis of six months or less life-expectancy. This bill redefines “terminal disease” to mean a disease that will, within reasonable medical judgment, “substantially contribute” to a patient’s death. The term “substantially contribute” has not been defined. On the federal level, the old S. 693 (Palliative Care and Hospice Education and Training Act) is being reintroduced in the House as H.R. 647. Be aware of its potential dangers. 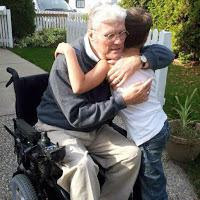 See the feature article in last month’s edition of the HALO Monthly: “The Federal Closet Euthanasia Bill – why it must be stopped” (https://newsletter.halorganization.com/2019_02_07_archive.html). Saturday was a full day of enlightening sessions. Disability rights speakers warned that eligibility for assisted suicide is ever-expanding and that people with disabilities are being targeted as candidates for assisted suicide. They emphasized that more people with experiences of disabilities need to get involved in fighting assisted suicide and euthanasia. Several speakers stressed the importance of talking points. Many common, everyday people have been convinced that assisted suicide is good. Therefore, common, everyday people need to be prepared with key talking points to reveal what is wrong with assisted suicide and why. Tons of facts against assisted suicide are outweighed by a few grams of emotion through “worst case” stories the other side provides to our legislators and the public. Sharing our own stories helps engage people in discussion and helps the facts to win. Illustrating this point, the EPC’s new film— “Fatal Flaws”—was shown. With a series of riveting personal testimonies from North America and Western Europe, “Fatal Flaws” reveals how lives have been fractured and families damaged through legalized assisted suicide. Another talking point is that some people’s lives will be ended through mistakes, misdiagnoses, or abuse, and sometimes without their consent. Safeguards simply don’t work to prevent errors, mistreatment, and exploitation. Nancy Elliott, former three-term New Hampshire legislator and president of EPC-USA, asked, “If assisted suicide and euthanasia are such honorable deaths, why would you hide it on the death certificates?” When people die by legal assisted suicide, every coroner and/or physician lies because, by law, they are not allowed to record assisted suicide as the cause of death. Instead, they list the cause as the person’s illness, covering up the assisted suicide that actually took place. The conference speakers urged everyone—in small and big roles—to become involved. We are battling against huge amounts of money, media promotion, and a culture of death disguised as compassion. The more people are informed with personal stories and the facts, the more they oppose assisted suicide. We ask you to do your part. One thing you can do right now is share this newsletter with your family and friends. Thank you. *Since the “Stopping Assisted Suicide in Your State” conference, more states have had assisted suicide bills introduced. We’ll describe them in our April edition, by which time, unfortunately, there are likely to be several more deadly bills introduced.Please do frequent online searches. If you discover a bill to legalize assisted suicide in your state, vigorously oppose it. Indifference is a surefire way to lose this life and death battle. Preface: The author of this article is the epitome of courage in the face of adversity. Mark is also a wonderful inspirational speaker and, we are proud to say, a member of the HALO Board of Advisors. --Julie Grimstad, President of HALO. I have had multiple sclerosis (MS) for thirty-five years. It’s a horrible disease. Multiple sclerosis has dragged me through many frightening disabilities (each one terrifying). It hasn’t been just me who has lived through terrifying symptoms of a serious neurological disease, my family was dragged along too. My wife once said, “It is harder to watch than to be” — and perhaps she is correct. To watch a loved-one suffer can be worse than being the one suffering. To think of things being turned around is too difficult for me to contemplate. My mind simply refuses to think of my wife bound to a wheelchair, sinking more with each attack of MS. We have lived through a long, painful journey spanning decades! Things got so serious at one point, I was threatened with the prospect of quadriplegia. I needed help getting dressed and tying my shoes. Someone else had to cut my meat at mealtime. I went into a full electric wheelchair equipped with side-braces to keep me from sagging sideways. My legs were tied to the leg rests to keep my feet from falling off the footrests. I couldn’t hold a pencil to write my own name. My bedroom was outfitted with a hoist to get me out of bed. Plans were being made to put a hoist in my bathroom to lift me into the bathtub. We drove a wheelchair accessible van. We built a barrier-free house to accommodate my disability. I am now at what is considered end-stage MS. The expected course is steady deterioration, a nursing home, or round-the-clock home care. That’s how bad things get, or at least that's how things are expected to go. A few years ago, I began to notice subtle changes. At first, they were so small (almost indiscernible) I did not mention them. Sometimes I thought wishful thinking might have merely created a perception of change. Then one night I woke from a deep sleep. God was there and He made me aware. But aware of what? I was told (not in words) to try to make my thumb touch my little finger. It had been years since I had the use of my right hand. I did it! I could make my thumb touch my pinky finger! It stunned me. It was not fleeting like so many neurological improvements. It stayed. Eventually, I could hold a spoon, a pencil, a cup, and use my right index finger to type on my computer keyboard. (For years, I typed with just my left hand's thumb, index and third finger.) It was as though my plaque-ridden brain was beginning to find new signal pathways. I could write again with my right hand! (I hadn't been able to do that for twenty years!) I showed this to my wife, but she was cautious; she had become excited so many times throughout the years, only to have her hopes dashed as new MS attacks stripped more physical function from me and the slightest improvement was lost. I awoke from sleep one morning able to struggle to sit up without using the hoist above my bed. I continued to refuse using the hoist. I used this window of opportunity for exercise to strengthen my trunk muscles. Eventually, we took the hoist down from above my bed. I fearfully took my first steps in years. My mother-in-law died at the end of 2013 at the age of 82, after a long time in a nursing home. My wife brought her walker home after the funeral. One morning, in the winter of 2014, I was sitting in my electric wheelchair at the kitchen table having morning coffee. The walker was folded in a corner of the kitchen. He spoke to me again: “Get out of your wheelchair and walk with the walker.” What? I hadn’t walked in years! But the message was emphatic and clear. Shaky and tentative, I stood and slowly, fearfully took my first steps in over a decade. My legs were atrophied and weak, but I took about five unsteady steps, ... then ten ... then I walked slowly with the walker down a hallway. It exhausted me, but I did it! My wife and I were ecstatic! After I rested, she taped me doing it. Sadly, the improvement was short-lived and I lost the ability to walk again—but it returned in 2016. I could walk short distances with a walker or two canes. This time the ability seemed to hold and I showed my doctor. She was incredulous. As I walked for her, I remember her exclaiming “No! It’s not possible!” And she was right. People with late-stage MS don’t improve, they sink. It was so incredible that another doctor came out of his office with his jaw on his chest to see for himself. I was sent to my neurologist for an explanation. He didn’t have one. By late 2018, I was using a walker for extended periods around the house—only using my wheelchair at the end of the day when I was tired or lazy. As we begin 2019, I am hopeful — perhaps too hopeful. My New Year’s resolution is to get in as good a shape as possible, continue to strengthen my legs, trunk and back with a goal to walk with one cane by the end of the year. Will it happen? I don’t know. Multiple sclerosis is a cruel teasing disease. It often returns function and raises hopes only to take it away. Whatever happens, I will use it as part of my Christian witness. I have to accept whatever happens and rest in the providence of God, trusting there is a reason for this unexpected but thrilling development. 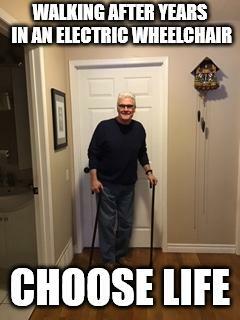 If I can walk, I will use it as part of my Christian witness. If I lose the ability to walk and return to my wheelchair, I will use the experience as part of my Christian witness. Either way, I will praise God. He has been with me, and sustained me, throughout this long 35-year journey. But today, I think I'll saunter down the hallway again. The video posted on my blog at http://www.humanlifematters.org/2019/01/update-walking-after-years-in-electric.html was taken on January 20, 2019. I've graduated from the walker to canes. Although I'm crooked because decades of severe back spasms twisted my spine, I am walking better and better. This is not supposed to happen with end-stage aggressive MS.
WHAT ABOUT VENTILATORS AND “PULLING THE PLUG”? When I first became a registered nurse in 1969, ICUs (intensive care units) were still new. The first one I worked was set up in the former visitors’ lounge. We learned how to read EKGs (heart tracings) by using a book. By the early 1970s, I worked in a surgical/trauma ICU where we used sophisticated ventilators. We were able to get almost all our patients off ventilators by weaning—the process of gradually lowering ventilator support until the patient can breathe on his or her own. However, in 1976, I was shocked by the Karen Quinlan case. It changed everything. Karen, 21- years old, had suffered brain damage after apparently taking drugs at a party. She was hospitalized and placed on a ventilator. Thought to be in a “persistent vegetative state”, her adoptive parents asked that her ventilator be removed. The doctors disagreed. Eventually the New Jersey Supreme Court allowed removal of the ventilator on the grounds of an individual’s right to privacy. Shortly afterward, California passed the first “living will”, an advance directive law that permits refusal of “life support” in the event the signer is incapacitated. Ironically, Karen lived 10 more years because, as some ethicists criticized, she was weaned off the ventilator instead of it being abruptly stopped. My experience with ventilators became personal in 1983 when my baby daughter, Karen, died on a ventilator before she could get open-heart surgery. One young doctor had offered to take her off the ventilator to “get this over with.” I reported him to the chief of cardiology who was furious with him. In the 1990s, I returned to working in an ICU and was shocked by the development of the “terminal wean” for some patients on ventilators. Often the families were told that there was no hope of a “meaningful” life. The terminal wean involved abruptly disconnecting the ventilator and “allowing” the patient to die. I brought up at least trying gradual weaning and oxygen as we did for the other patients on ventilators, but I was ignored. After retiring from bedside nursing, I was asked to be with an elderly man on a ventilator who had suffered a massive stroke. The family was told that he would never have any quality of life and would die soon. I tried to bring up gradual weaning. but some members of the family were adamantly opposed. When the ventilator was stopped, I held the man’s hand and prayed while he gasped for air and turned blue. I asked the nurse to at least giving him oxygen for comfort, but she ignored me. Instead, she gave frequent doses of morphine intravenously until the man’s heart stopped after 20 minutes. I’m still haunted by this man’s death. The medical definition of informed consent requires understanding “the purpose, benefits, and potential risks of a medical or surgical intervention….” But most people, when they sign a medical advance directive, have only a vague understanding of the ventilator and very little information about this often life-saving medical intervention. As a nurse, I found that most people—especially the elderly—tend to automatically check off ventilators without understanding that a sudden problem with breathing can come from treatable conditions that don’t require long-term use of a ventilator, such as asthma, drug overdose, pneumonia, and some brain injuries. In some circumstances, such as certain spinal cord injuries and late-stage neurodegenerative diseases like amyotrophic lateral sclerosis, the ventilator is necessary long-term to live. People like Christopher Reeve and Stephen Hawking have used portable ventilators to continue with their lives. Some people with disabilities use small ventilators only at night. It is important to know that ventilators move air in and out of the lungs but do not cause respiration—the exchange of oxygen and carbon dioxide that occurs in lungs and body tissues. Respiration can occur only when the body’s respiratory and circulatory systems are intact. A ventilator cannot keep a corpse alive. It’s also important to know that not all machines that assist breathing require the insertion of a tube into the windpipe. Non-invasive positive-pressure ventilation (like the BiPap) allowed my elderly friend Melissa to use a face mask to assist her breathing until antibiotics cured her pneumonia. Many patients are easy to wean from a ventilator, but some are more difficult. Years ago, I cared for an elderly woman with Alzheimer’s who needed a ventilator when she developed pneumonia. She had made her son and daughter her medical decision makers in her advance directive. When the woman improved, the doctors found it very difficult to wean her from the ventilator. They spoke to the family about removing the ventilator and letting her die. The daughter agreed but the son was adamantly against this. The woman was totally awake after the sedation to keep her comfortable on the ventilator was stopped. She was cooperative and made no effort to pull out the tube in her windpipe. She just smiled when asked if she wanted the ventilator stopped. I knew some great respiratory therapists in the past who were able to successfully wean difficult patients from ventilators. At my suggestion, she was transferred and a week later we were told that she was successfully weaned. About a year later, I encountered the woman again when she was recuperating after routine surgery. Although her Alzheimer’s disease was unchanged, she was doing well in an assisted living residence. As a student nurse, I was initially intimidated by ventilators. As I learned how to use them and saw the constant improvements, not only in the technology but also in our care of patients on ventilators, I came to see ventilators as a great blessing when needed. While we are never required to accept treatment that is medically futile or excessively burdensome to us, sometimes this can be hard to determine in a crisis. Most of my patients on ventilators recovered, but some could not be saved. We were surprised and humbled when patients with poor prognoses recovered while others who seemed to have a better chance died unexpectedly. There are no guarantees in life or death. That is why my husband and I wrote advance directives that designate each other as our decision maker with the right to have all current options, risks and benefits of treatment fully explained. We don’t want an advance directive that could be hazardous to our health! Note: To learn more about medical advance directives or to download HALO’s LAMP (Life-Affirming Medical Proxy) document, visit our website at www.HALOrganization.com. 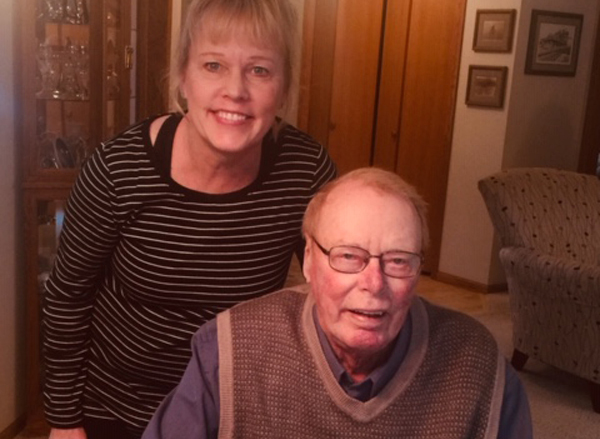 My 83-year-old father, Jack, broke his hip on October 7, 2018. Sadly, he passed away on December 12, 2018. This is a brief summary of Dad’s last two months, highlighting the unsettling issues we faced with Hospice. I was, by turns, very concerned, confused, frustrated, angry, and even completely shocked at the way in which my dad's last two months of life were handled by health care providers. I am forever grateful to Jo Tolck (vice president of HALO) for guiding us through this difficult time, especially for her assistance in the last few weeks of Dad’s life. I can’t thank Jo enough for her commitment to respecting and honoring the God-given dignity of my father and helping us discern the "right" and "wrong" in a very broken care giving system. There were good caregivers, and I certainly do not want to negate that. We are very grateful for the care and very hard work of one doctor and many nurses in getting him well enough to leave the hospital. However, the strong and continual pressure exerted on my family to allow my father to be unnecessarily sedated was very distressing. In addition, we were unduly pressured to "find a hospice organization" before we left the hospital. With calm determination, we did take charge. Prior to his hospital discharge, we attended a “palliative care meeting” where we were told his situation was dire, and that we would "need" to decide on hospice care. That was confusing, because he was going back to a long-term care facility. Why did we need to choose a hospice when care would be provided by the facility’s staff? Plus, three members of the family were "tag teaming"; he would never be alone. It was hard enough to face everything we were going though without being told “you need to do this.” Despite our objections, we were each handed a generic Hospice and Palliative Care book provided by the hospital. Who had time to read a book? The HALO fact sheet "Drugs Commonly Used in Hospice and Palliative Care"(https://halorganization.com/pdf/drug-sheet.pdf) was an invaluable guide for our family. My father had dementia. Previously, when Dad had surgery, we had learned which drugs were not appropriate for him due to his dementia and age. The HALO fact sheet helped us work with the medical professionals to ensure that he received appropriate treatment for pain and agitation when needed. At first, the medical people at the long-term care facility were not cooperative. Nevertheless, with calm determination, we did take charge. We asked for a print out of Dad’s medications and their dosages so that we would be aware of everything that was being given to him. We preferred that his medications not be "scheduled" and wanted his chart to state that his medications were to be given “PRN”—that is “as needed.” We made decisions based on what we observed and what he said his pain level was. Had he been overly sedated, he wouldn't have been awake to let us know if he was in pain. Also, we wouldn’t have seen him smile and heard him talk or laugh! In fact, Dad rarely experienced pain. At one point, we asked him several times an hour to make sure. He would say no or shake his head. Most of the time, his facial expressions would confirm that he was not in pain. When his respirations started to increase, we knew he was uncomfortable and addressed it. When we saw that he was thirsty, we spoon fed him thickened liquid (he was at risk of aspiration). He loved the thickened "ice cream," as we called it! Because of my father's multiple serious health issues, we were aware that his life was fragile; we were certainly not in denial of this. However, I saw my father as living and present to us. Every moment was an opportunity to care for him and show love to him; to try to understand his needs and do all that we could to help him. There was obviously no need for hospice, but the pressure mounted. There was a care conference within 48 hours of his return to the long-term care facility. This time we were given a list of Hospice Organizations around the Twin Cities (Minneapolis and St. Paul, MN). The staff members at this meeting firmly intended to get this hospice idea into our heads and hoped we’d make a decision in the next 24 hours. We had no intention of choosing one, but out of curiosity I called a few of them. I immediately saw the red flags. From the article "Interviewing a Hospice Agency" in Informed (https://resources.humanlife.org/pdf/informed.pdf), a publication edited by Julie Grimstad (president of HALO), I asked question 3: “Is your Hospice agency pro-life?” Not one person even knew what "pro-life" meant, regarding an older person like my father. The hospice agencies I contacted uniformly answered that their visits were primarily once a week, for about a half hour at a time. Really? How do you get to know anything about a person, let alone one who may be sleeping, in that short amount of time? What kind of "comfort" can you really give him when he is a stranger to you? What are you going to do for him anyway? I was completely confused by all of this! The most shocking event happened the day before my dad passed away. The last nine nights of my dad's life, I slept on a cot by his bed. Usually, by mid to late morning, my mother would arrive at my dad's room and I would go home for awhile. That day, I just happened to stay later. A woman representing a well-known hospice organization walked into the room. I was sitting in the corner. She looked startled when she saw ME there. She focused on my mother, without even a glance at my father lying in bed. My mother was in a vulnerable position at that time. She had the slight belief that hospice could possibly do something "good" for my father. Hospice today is not at all like it was in the past. My mother was clearly confused, and this woman was putting pressure—albeit "compassionate"—on my mother to sign up for hospice. My mother, clearly unable to make a decision, asked me what we should do. Her dear husband of 58 years was dying. I thanked the woman and told her we were not interested. Then, suddenly, a thought occurred to me, so I looked at her and asked, "What ARE you going to do for him?” The woman was obviously surprised at my blunt question. She responded that hospice knows more about pain control. I pointed out that Dad wasn’t in pain, but only became a little agitated at night sometimes. His agitation was relieved by a low dose of medication. There was obviously no need for hospice. She left the room, but I later noticed that she was still sitting outside with a nurse, possibly waiting for me to leave so she could approach my mother again. I stayed with my mother and father until I was certain she had left the facility. That situation told me all I needed to know. This hospice representative had intended to speak only with my mother. She had tried to create a division in the family, knowing full well that other family members and I did not want hospice. My grieving mother was lost and confused. She needed her family to help make decisions. In the end, Hospice did not show any respect for my father's life or for his family’s wishes. We had many beautiful moments with my father before his death. When my father passed, I was so grateful to be at his side. I believe he passed into his eternal home in our good Lord's timing; peacefully—without being in a drug induced unconscious state. We were able to communicate, hug him, laugh and cry with him almost up to the day of his passing. We had many beautiful moments with him that I will never forget. Hospice, a wonderful, authentic mission to serve those at the end-of-life, was shown to the world through the works of Dr. Cicely Saunders. However, a secular utilitarian counterfeit has mostly replaced what people expect when their loved one is admitted to hospice care. You may be surprised to learn that one "arm" of the euthanasia movement literally took over most of the hospice industry and is carrying out involuntary medical killing without admitting what they are doing. Reports of these widespread killings are censored by government officials and the media, so people are not prepared to defend their family members. This is "stealth euthanasia," and it violates the ethics we expect from those who are trusted to care, not kill. The Stealth Euthanasia book reveals what has been hidden from you and explains what is happening, and why and how it is happening. The knowledge shared in this book will help you protect your loved ones! Symposium Proceedings “Medical education in the shadow of ‘stealth euthanasia’” among Catholics: Are we fighting secularism or heresy? Committing stealth euthanasia by withholding food and water from patients who are not dying but merely have their ability to eat and swallow impaired, such as victims of stroke, dementia, Parkinsonism, etc., is only the tip of the iceberg. It is often claimed that a PEG (percutaneous endoscopic gastrostomy) tube does not offer any benefit because it does not cure or improve the disease process itself. These patients are inappropriately referred to hospice as if they were, in fact, dying. And of course, it becomes a self-fulfilling prophecy when they die from dehydration and malnutrition. Now let’s turn to the big question which needs to be confronted: Why is the practice of stealth euthanasia just as common in many Catholic healthcare institutions as it is among secular healthcare providers? Why is the withdrawal and withholding of ordinary medical treatments routinely approved by Catholic ethics committees and justified by many Catholic ethicists and theologians? And what can be done to reverse this trend?